Long distance transport in plants occurs in sieve tubes of the phloem. The pressure flow hypothesis introduced by Ernst Münch in 1930 describes a mechanism of osmotically generated pressure differentials that are supposed to drive the movement of sugars and other solutes in the phloem, but this hypothesis has long faced major challenges. The key issue is whether the conductance of sieve tubes, including sieve plate pores, is sufficient to allow pressure flow. We show that with increasing distance between source and sink, sieve tube conductivity and turgor increases dramatically in Ipomoea nil. Our results provide strong support for the Münch hypothesis, while providing new tools for the investigation of one of the least understood plant tissues. Plants use energy from sunlight to make sugars in a process called photosynthesis. Most photosynthesis takes place in the leaves and so much of the sugar needs to be transported to other parts of the plant, such as fruits or roots. The sugars are transported by phloem tubes, which form a system that spans the entire plant. In 1930, a German scientist called Ernst Münch proposed a hypothesis for how phloem tubes move sugars and other molecules around the plant. He proposed that the loading of these molecules into phloem tubes in the leaves or other “source" tissues makes the fluid inside the vessels more concentrated so that water is drawn into the phloem from neighboring “xylem” vessels. This creates pressure that pushes the fluid along the phloem tube towards the fruit, roots and other “sink” tissues. In the sink tissues the sugars are consumed, which reduces their concentration in the phloem and the pressure. Overall, this results in the flow of sugars and other molecules from where they are produced to where they are most needed. However, this hypothesis is still largely untested because it has proved difficult to carry out experiments on phloem. Detaching the source tissues from the sink tissues stops the flow of fluid so only experiments in whole plants can provide meaningful data. Knoblauch et al. have now developed new methods to study phloem in an ornamental plant called morning glory. The experiments show that plants can alter the shape of phloem vessels and the pressure within the vessels to allow them to transport sugars and other molecules over different distances. These findings strongly support the Münch hypothesis and make other alternative hypotheses seem unlikely. Furthermore, the methods developed by Knoblauch et al. will allow others to further investigate phloem transport. New findings in this area may allow plant biologists to direct the flow of sugars and other molecules towards particular plant tissues to improve the nutritional quality of food crops in the future. Vascular systems allow organisms to distribute resources internally by bulk flow and thus to overcome size limitations set by diffusion. In plants, the evolution of vascular tissues enabled the development of trees and forests and was accompanied by a major increase in the productivity of terrestrial ecosystems. Plant vascular tissues are of two types: the xylem allows water to be pulled from the soil to maintain the hydration of leaves surrounded by air, while the phloem distributes the products of photosynthesis throughout the plant, allowing non-photosynthetic structures, such as roots, to be formed. The current hypothesis for phloem transport dates to 1930 when Ernst Münch proposed that transport through the phloem results from osmotically generated differences between the pressure in sources (e.g. leaves) and sinks (e.g. roots), and occurs without any additional input of energy along the transport path (Münch, 1930). The Münch hypothesis has gained wide acceptance based to a large extent on its simplicity and plausibility, rather than on experimental evidence. 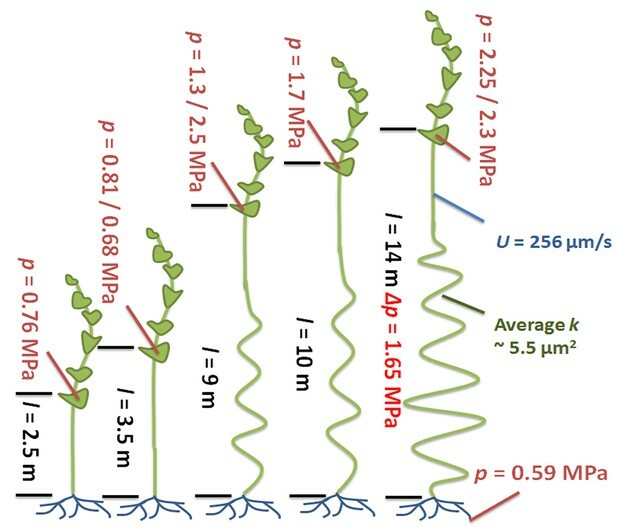 A fundamental issue bedeviling the pressure flow hypothesis is the long standing question of whether sieve tubes have sufficient hydraulic conductivity to allow sugars to be transported from leaves to roots in the largest and longest of plants. Increasing distances between sources and sinks would appear to require greater pressure to drive flow, but measurements suggest lower source turgor in trees compared to smaller, herbaceous plants (e.g., crops or weeds; Turgeon, 2010). A number of authors have emphasized the difficulty of accommodating the Münch hypothesis in trees, leading to the proposal of re-loading mechanisms via relays (Lang, 1979; Aikman, 1980). However, it is important to note that such challenges derive in large part from mathematical models of phloem transport in which the values of one or more of the key variables are unknown or poorly constrained (Tyree et al., 1974; Pickard and Abraham-Shrauner, 2009; Thompson and Holbrook, 2003; Hölttä et al., 2009). where U is the flow velocity, Δp is the pressure differential, L is the tube length, η is the sap viscosity, and k is the conductivity of the tube. Previously, methods only existed for two of the five parameters: length, which is the distance between source and sink, and velocity, which can be determined using radioisotopes (Babst et al., 2005), magnetic resonance imaging (Mullendore et al., 2010), or dye tracking (Savage et al., 2013). 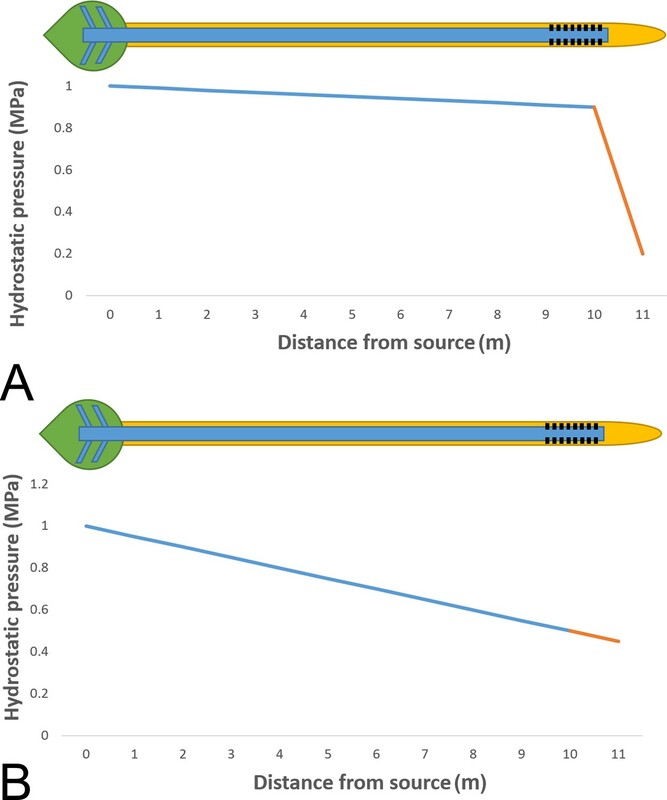 We have recently introduced methods to measure the missing parameters including new EM preparation protocols and mathematical modeling to quantify sieve tube hydraulic resistance (Froelich et al., 2011; Mullendore et al., 2010; Jensen et al., 2012); a novel micro-capillary pressure probe to determine pressure in small and sensitive cells such as sieve tubes (Knoblauch et al., 2014); and protocols for in situ observation and flow velocity measurements in individual tubes (Froelich et al., 2011). A new method for determining phloem sap viscosity in vivo using fluorescence lifetime imaging of the fluorophore 2-NBDG is described. Here we present a study on phloem flow relevant parameters that tackles the major question on the pressure flow hypothesis. 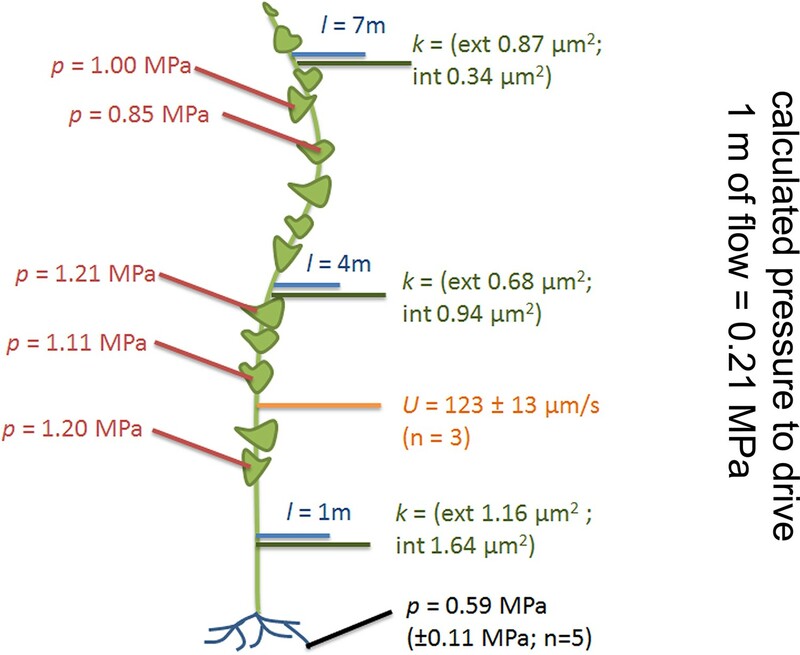 Our data provide strong support for the Münch hypothesis as a unifying mechanism of long distance transport in plants. The results also call into question current understanding of downstream events such as the “high pressure manifold model” of phloem unloading and carbohydrate delivery to sinks. The toolset described here will allow for detailed research on phloem transport and resource allocation, processes critical for food security and improvement of bioenergy crops, as well as understanding ecosystem ecology and the global carbon cycle. To test whether phloem parameters scale in accord with the Münch hypothesis, we chose to study morning glory (Ipomoea nil) vines because this species exhibits indeterminate growth, thus allowing us to test the predictions of the Münch model for a wide range of tube lengths (L). Moreover, its growth pattern is easy to manipulate, and it loads various fluorophores into its phloem. To simplify analysis, we allowed the plants to produce only one axis with two major sinks (root and shoot tip) by pruning all developing side branches and flowers daily. We first acquired baseline parameters from 7.5 m long plants (Figure 1) and measured anatomical parameters at locations 1 m, 4 m, and 7 m (Figure 1 E-J). The acquisition of geometrical parameters requires the highest accuracy because minor changes in tube geometry have a large impact on the calculated conductivity. This is the main reason why current models have to cope with large uncertainties. In addition, the natural variation of tube parameters requires the acquisition of large data sets. For this study, more than 1000 SEM and confocal images were taken, >100,000 sieve plate pore numbers were counted (in ≥10 plates per data point), and >15,000 sieve plate pore diameters (n ≥ 380 per data point), >1500 sieve element diameters (n ≥ 10 per data point), and >800 sieve element lengths (n ≥ 10 per data point) were measured. Changes in sieve tube geometry including sieve element radius (Figure 1E), sieve element length (Figure 1F), sieve plate pore number (Figure 1G) and sieve plate pore radius (Figure 1H) caused a slight increase in sieve tube specific conductivity (see appendix for specifics on conductivity calculations) towards the base of the 7.5 m plant (Figure 1I) of around 1 µm2. Measurement of the total phloem area from high resolution confocal images of stem cross sections (Figure 1—figure supplement 1A) showed similar external and internal phloem areas during primary growth (Figure 1—figure supplement 1B), but a much larger increase of external phloem area during secondary growth. Geometrical parameters of a moderate sized morning glory plant. The basipetal flow velocity on the stem was determined by application of 11CO2 to one source leaf approximately 3 m from the shoot base (see Materials and methods section). The average flow velocity was 123 ± 13 µm/s (n = 3; Figure 2). Phloem flow relevant parameters in a medium sized morning glory plant. An illustration summarizing the findings in a medium sized plant with leaves attached along the entire length of the stem. Cell geometrical data were taken at 1 m, 4 m, and 7 m (blue lines) along the stem. Resulting conductivities are indicated in green. Source sieve tube turgor measurements (red) were taken in the main vein of leaves along the stem axis, sink turgor (black) in root tips, and average flow velocity was measured using 11CO2 labeling (orange). Currently, phloem sap viscosity has not been directly measured, but only estimated based on the concentrations of extracted phloem sap contents (Thompson and Holbrook, 2003). Recently, a group of dyes has been identified that can be loaded into the phloem (Knoblauch et al., 2015). We tested carboxyfluorscein diacetate (CFDA), 8-Hydroxypyrene-1,3,6-trisulfonic acid acetate (HPTSA), Esculin, 2-(N-(7-Nitrobenz-2-oxa-1,3-diazol-4-yl)Amino)-2-Deoxyglucose (2-NDBG), and carboxytetraethylrhodamine glucoside (CTER) for potential molecular rotor properties which allow the measurement of solute viscosity due to viscosity dependent changes in fluorescence decay times determined with fluorescence lifetime imaging (FLIM). FLIM calibrations confirmed that 2-NBDG is a molecular rotor. To determine the phloem sap viscosity in situ, sieve elements were loaded with 2-NBDG and the decay of fluorescence lifetime was measured to generate a color coded viscosity map of the phloem (Figure 2—figure supplement 1). The average fluorescence lifetime of 2-NBDG in source phloem in morning glory was 1.366 ns (± 0.037 ns, n = 8), which corresponds to a viscosity of 1.7 mPas or a sucrose concentration of about 18%. This value is within the range of estimates based on solute concentrations in phloem sap extracts of various plant species (Jensen et al., 2013). Using these parameters (σ,= 1.7 mPas, k = 1 µm2, U = 123 µm/s) we estimated that a pressure differential of 0.21 MPa would be required to drive flow through a 1 m long tube of the determined anatomy. To evaluate if such a pressure differential exists between source and sink tissue, we measured phloem pressure in situ. In situ sieve tube turgor pressure measurement using a pico gauge. Real time video of a pico gauge measurement. The fluorescence of a distantly loaded sieve tube provides evidence for tube intactness and transport. The oil – water interface in the pico gauge moves backwards when the pico gauge is impaled into the sieve tube, indicating compression of the oil volume. Inflow of fluorescent dye into the pico gauge tip provides evidence that the measurement occured in the sieve tube. Because the phloem is embedded in a thick tissue layer, in situ experiments have to be carried out by removing cortical tissue until the sieve tubes are exposed, but care must be taken to not injure the tubes. The preparation was achieved by making cortical hand sections with fresh razor blades as described earlier (Knoblauch and van Bel, 1998). Other methods such as laser ablation or sectioning by micromanipulators appear more elegant, but turned out to cause massive artifacts and flow stoppage. The section has to be as accurate as a twentieth of a millimeter in order to be useful for measurements of sieve tubes. This reduces the success rate to below 30% even for very experienced investigators. If sieve tubes were injured, the leaf was removed and the plant was allowed to recover for at least 24 hr. If a section appeared successful, upstream application of phloem mobile fluorescent dyes was used to verify intactness by monitoring translocation of the dye through the tube (Video 1, Figure 2—figure supplement 2). The preparation required the tissue to be covered with an artificial medium, which could have had an influence on sieve tube turgor. However, the low resistance between sieve elements provided a buffer for local disturbance. If the medium resulted in a local increase in turgor, an artificial source would have been generated and flow would reverse towards the leaf and no fluorochromes would have arrived at the site of observation. If preparation decreased turgor, a local sink would have been induced and flow would have been towards the area of preparation from both sides. The applied fluorochromes would eventually have arrived at the site of observation but would not have passed by. In all cases, turgor measurements were conducted on tubes showing quickly increasing fluorescence downstream of the site of preparation indicating that the applied medium did not disturb turgor pressure inside the sieve tube. Sieve tube turgor in source leaves (Figure 2) at different levels along the stem averaged 1.08 MPa (± 0.13 MPa, n = 5). The anatomy of sinks (e.g. roots) does not permit direct measurements in sieve tubes. However, since phloem unloading in root tips follows a symplastic path (Figure 2—figure supplement 3; Wright and Oparka, 1997; Patrick, 1997; 2013) the pressure in root cortical cells cannot be (significantly) higher than in sink sieve tubes. In situ turgor measurements in the cortex of the root elongation zone revealed a sink turgor of 0.59 MPa (± 0.11 MPa; n = 5). Therefore the measured pressure differential of 0.49 MPa could account for a pressure flow since the distance from a sink to the closest source did not exceed 2 m and a pressure gradient of 0.21 MPa/m is required to drive the flow. 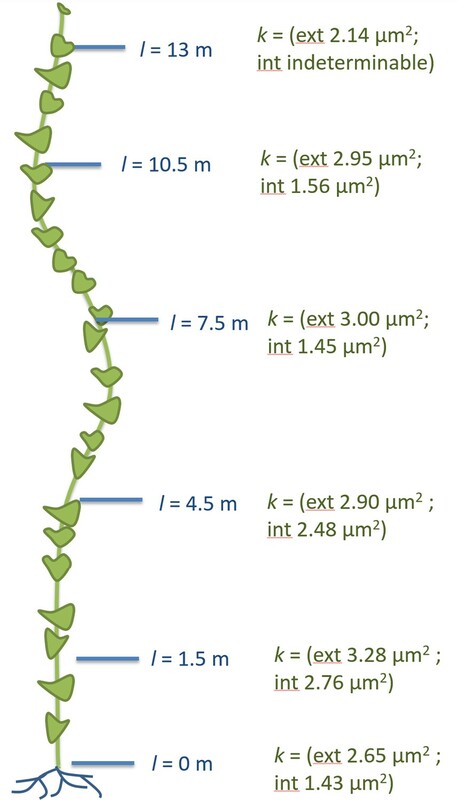 Having established the baseline parameters in a moderate-sized plant, we investigated if the parameters scale with increasing transport distance, a treatment we achieved by increasing the length of the stem without source leaves (Figure 3; Figure 3—figure supplement 1). In response to this treatment, the plant must change conductivity, pressure, velocity, or viscosity (or any combination of those) to maintain sink assimilate delivery if a passive pressure flow is the mode of translocation. Over the course of 5 months all newly developing tissues (leaves, side shoots) below the top 4 m were pruned daily. Phloem pressure was measured in situ (Video 1) in the main vein of the lowermost leaf throughout the growth period until the single stem of the plant was 17.5 m long with about 14 m of stem free of source leaves (Figure 4). At this time point, we measured phloem flow velocity by 11CO2 application and used micro PET scanning to confirm phloem translocation direction (Figure 4—figure supplement 1). Afterwards, the tissue was harvested, cell geometrical data were collected at 1 m increments along the stem, and tube conductivity was estimated (Figure 3 A-F). Geometrical parameters of a large morning glory plant with partially defoliated stem. Geometrical data of a 17.5 m long morning glory plant after 5 months growth with daily removal of developing side branches and flowers as well as removal of source leaves below the top 4 m. (A) Total phloem area at different locations along the shoot. Plotting phloem area versus distance indicates that only the external phloem (blue) increases in area significantly (internal phloem, red). (B–F) Cell geometrical data for sieve element radius (B; n ≥ 10 per data point), sieve element length (C; n ≥ 10 per data point), sieve plate pore number (D; n ≥ 10 per data point), and sieve plate pore radius (E; n ≥ 380 per data point) reveal that sieve tube conductivity (F) increases with the length of the transport pathway. Please see Figure 3—figure supplement 3 for a comparison of the parameters and standard deviations between the moderate sized foliated morning glory (Figure 1) and the partially defoliated large morning glory plant. Phloem flow relevant parameters in a morning glory plant with increasing leafless stem length. An illustration summarizing the findings in large morning glory plants after artificial increase of source-to-sink transport distance achieved through continuous partial defoliation. Leaves were maintained only on the upper four meters of the plant and pressure was measured throughout the growth period. Plants with a short distance between the leaves and the roots maintain a relatively low sieve tube turgor pressure (crimson) in the source phloem in the range of 0.7–0.8 MPa, but the pressure scales with increasing length (black) of defoliated stem and the conductivity increases ~5 fold (green) compared with the 7.5 m long plant shown in Figure 1 and 2. Flow velocity (blue) was measured by 11C application. Source sieve tube turgor pressure was 0.75 (± 0.05 n = 3) MPa in young plants and increased to more than 2.2 MPa at the end of the experiment (Figure 4) when the distance from the lowest leaf to the base of the stem was 14 m with a transport distance of 17.5 m when applying a correction factor of 1.25 to account for helical stem growth (Figure 4—figure supplement 2). Despite the high pressure generated in source tissue, the pressure differential (assuming sink turgor of 0.59 MPa) would have allowed photoassimilates to be transported only 3.7 m at a measured flow velocity of 256 µm/s, if the tube geometry in the long plants was the same as in the smaller plants. Instead, sieve tube conductivity increased 5-to-6 fold compared to fully foliated young plants (Figure 3F) mainly due to a significant increase in average sieve plate pore radius (Figure 3E, Figure 3—figure supplement 3). Taking into account the much higher conductivity, the estimated maximum transport distance is 20.35 m, which is in good agreement with the actual stem length, especially given that transport distance in the roots is not included. The change in sieve tube conductivity appears to be largely a response to the increased distance between source leaves and the sink (roots) as the average sieve tube conductivity of a 13 m long morning glory plant with source leaves all along its stem was only 2.8 µm2 (Figure 5). Tilting of the sieve plate, and formation of compound instead of simple sieve plates increases the sieve plate area to allow larger pores (Figure 3—figure supplement 2). 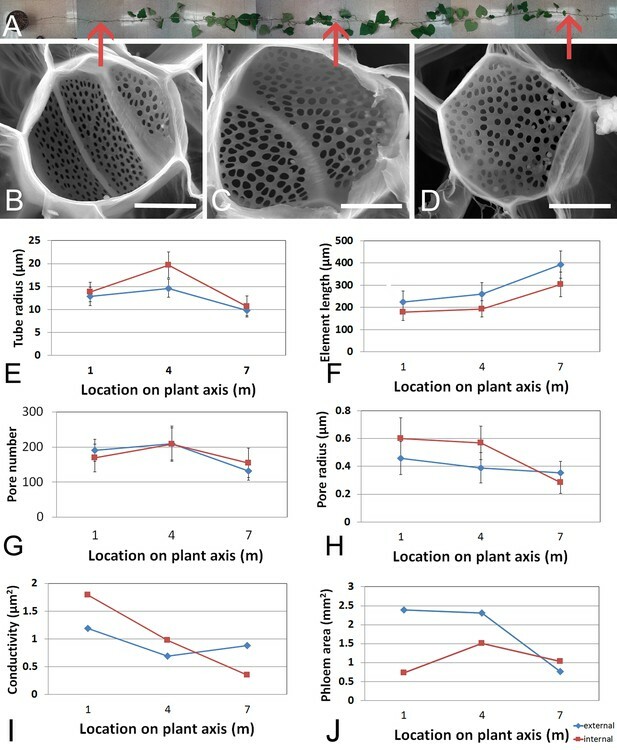 Measurement of the total phloem area from confocal micrographs (Figure 3A; Figure 3—figure supplement 1, Figure 3—figure supplement 3) indicated a significant increase of the external phloem area compared to plants with leaves along their entire stem, suggesting that the continuous extension of the distance between source and sink induces cambial activity to produce new sieve tubes with higher conductivity. Interestingly, despite a slight increase in tube conductivity, the conducting area of the internal phloem actually decreases (Figure 3—figure supplement 3F). This is attributed to the restricted space when secondary xylem and phloem is formed by the internal cambium. The significant reduction of the pith diameter in older tissue indicates the space limitations for internal secondary phloem. Therefore, the impact of the internal phloem on whole phloem transport decreases with increasing secondary growth. Anatomical adjustments to growth conditions. An illustration summarizing the findings in a large morning glory plant with leaves along the length of the stem. In contrast to partially defoliated plants, the conductivity remains relatively low, likely due to the shorter distance from source leaves to sink tissue. These studies on morning glory show that when the transport length is increased, sieve tube conductivity and pressure increase accordingly. The observations provide strong support for pressure driven long distance transport. In this study we address the major question about phloem transport in angiosperms: do phloem parameters scale in accord with the Münch hypothesis? We found that large morning glory vines exhibited a significant increase in the conductivity of sieve tubes in the external phloem and that this increase was primarily due to larger sieve plate pores. In addition to changes in sieve tube structure, the pressure in sieve tubes scaled with the distance between leaves and roots, such that morning glory plants with greater distance separating leaves and roots had significantly higher source turgor pressures. In summary, plants actively adjust flow relevant parameters to accommodate a passive pressure driven mass flow. After almost a century, we finally have experimental evidence that addresses the key challenge to the pressure flow hypothesis. Although many cellular aspects, such as the function of most p-proteins and sieve element plastids, remains unclear, the overall transport concept proposed by Münch is supported. Prior to our study, many of the parameters governing phloem transport were poorly quantified. Thus, an additional important outcome of the study is a toolkit' for determining all of the parameters affecting flow. This means, that our work opens the door to new studies of phloem function. Foremost among the questions to be answered are how plants control the distribution of resources needed to support assimilate storage and the growth of new tissues. Phloem unloading fills the reservoirs of the most important human food sources (primary sources such as fruits, roots, tubers, cereals, and through consumption also other sources such as meat) but our understanding of the unloading mechanism is similarly rudimentary. A currently popular modification of the Münch hypothesis that also accounts for phloem unloading is the high pressure manifold model (Patrick, 2013). This model proposes maintenance of high hydrostatic pressures throughout the sieve tube system with minimal pressure differences from source to sink, but high differences between sieve elements and surrounding cells in the unloading zone (Figure 6A). Our data, however, suggest that tube resistance will consume most of the energy provided by the source pressure to allow flow at the measured velocities (Figure 6B). Most importantly and contrary to the high pressure manifold model, small morning glory plants generate only low pressures sufficient for flow, but not additional large margins to maintain high pressure differentials in the unloading zone. This suggests that at least in the species investigated, either plasmodesmal conductance in the unloading zone is very high for passive unloading, or additional energy, e.g. in form of active unloading processes, is required. A better understanding of short and long distance flow patterns and assimilate distribution in plants will be necessary to resolve these important questions. Phloem pressure gradients in relation to phloem unloading. Schematic drawing of a single source leaf (green) loading assimilates into the phloem (blue) and unloading through plasmodesmata (black) into a single root tip (yellow). (A) Independent of the plant size the pressure manifold model proposes nearly uniform high pressure along the stem, but large differences between sieve elements and surrounding cells in the unloading zone where the steepest gradients are found. (B) Our data suggest that tube resistance in the stem of morning glory plants consumes most of the pressure gradient, contrary to the high pressure manifold model. Organisms are structures whose integrity depends on active and passive flows. While active flows are dominated by proteins in the form of cytoskeletal elements or membrane transporters, passive flow is dependent on cell geometry and cellular connections in orchestration with concentration gradients and osmotic potentials (which are again generated by active flows). The lack of precise geometrical data of cellular connections is therefore a major problem, as this information forms the basis for modeling long distance flow patterns of assimilates, signaling molecules, and other substances. Large-scale efforts to collect cell geometrical data (a field one may call quantitative anatomy or 'Anatomics') at a resolution sufficient to extract sieve tube connections, diameters, length as well as plasmodesmal frequencies etc. throughout the plant are needed. Integration of physiological and molecular data (e.g. cell surface specific distribution of membrane transporters etc.) into a 'virtual model plant could lead to a major step forward in rationally designing crop plants to meet future societal and environmental needs. To accomplish this methods for tissue preparation, automated acquisition, and reconstruction need to be combined, but the technology is available. Due to the long growth period needed to attain large stem axes, plants were started in the greenhouse in February in pots at 23°C, with 60 to 70% relative humidity, and a 14/10 hr light/dark period (daylight plus additional lamp light [model #PL 90 (PL Lighting Systems, Ontario, Canada)] with a minimum irradiance of 150 µE m-2 s-1. The plants were moved outside at the end of May. The plants were grown on ropes to allow climbing and easy transport. Morning glory is a fast growing vine, but highly susceptible to pests. Primarily spider mites and aphids quickly grow in high numbers and have devastating impacts on the plants. In order to prevent potential effects of systemic pesticides on the plant’s physiology, we chose to remove pests manually. Usually every day, but at least 4 days per week we checked every leaf and the stem of each plant and removed pests by spraying them off with a fine mist of water. All developing side branches and flower buds were pruned at the same time to maintain one single stem. Due to higher abundance of predators, pest infestation was much lower outside compared to in the greenhouse. Plants were transferred from the growth site to the lab just before the experiment was conducted. Phloem transport has been shown to be very stable and that diurnal changes have little or no impact on phloem transport velocities, likely due to sufficient starch pools even when photosynthesis capacity changes (Windt et al., 2006). Therefore we did not expect negative effects of movement of the plants. At the main vein of the lowermost source leaf, a small paradermal section to remove cortical tissue and to expose sieve elements was made with a fresh razor blade by hand. The section was immediately covered with phloem recovery medium consisting of 10 mM KCl, 10 mM NaCl, and 0.2 mM EDTA in unbuffered distilled water. Since the sieve tube to be measured must be the uppermost uninjured cell, the section was checked under the microscope. If sieve tube damage was observed, i.e. the cut was too deep, the leaf was removed and the plant was brought back to the growth site and a new attempt was performed after a recovery period of at least one day. If the section appeared useful in that the sieve tubes were well visible and appeared uninjured, a phloem mobile dye (CDFA or Esculin, Sigma-Aldrich, St. Louis, MO) was injected locally into the leaf apoplast about 5 cm upstream of the preparation site by pushing the dye solution through the stomata with the blunt end of a 3 ml syringe. About 2 cm2 were filled with dye to provide sufficient fluorochromes for visualization after phloem loading. After filling up the apoplast, the phloem at the preparation site was observed for arrival of the fluorochromes which usually took 20–30 min. Translocating, intact tubes exposed to the surface were measured by impaling pico-gauges into the tube and monitoring the compression of the pico-gauge filling oil. Pico gauge production and pressure calculations were performed as described in detail in (Knoblauch et al., 2014). Sink root pressure was measured in root tips of morning glory plants grown in the greenhouse under standard conditions (see above). The plant was removed from its pot with the soil still attached to the roots and transferred into a plastic bag to keep roots moist. A small hole was cut into the bag, a single root was pulled out and covered with moist paper towels to maintain humidity. The root tip was immersed in water, and held in place by using a glass slide as weight. Measurements were carried out using pico gauges, produced by method A as described in (Knoblauch et al., 2014). About 2–3 min were given for temperature adjustments of the pico gauges to the surroundings. A Sutter Instruments (Novato, CA) model MPC 200 micromanipulator was used to control movement of the pico gauges. To take measurements, cortex cells of the root were impaled with a pico gauge and measurements were recorded at approximately 6 frames per second using a Leica DFC 450 camera, mounted to a Leica DM LFSA microscope equipped with a HCX Plan APO 40x lens. (Leica, Wetzlar, Germany). Data processing was conducted as described earlier (Knoblauch et al., 2014). In situ viscosity measurements were conducted by loading 2-NBDG into source tissue of intact morning glory plants by pressure injection of 2-NBDG solution through the stomata using the blunt end opening of a 5 ml syringe. Fluorescence was observed downstream of the application site (Knoblauch and van Bel, 1998). Measurements were carried out on a Leica SP8 SMD white light laser system equipped with a pico quant FLIM attachment. The dye was excited with the 470 nm line of the supercontinuum laser and emission light was collected between 490 nm and 550 nm. Carbon-11, as 11CO2, was generated by the 14N(p,α)11C nuclear transformation (Ferrieri and Wolf, 1983), on an 19 MeV cyclotron (EBCO, Richmond, British Columbia, Canada). The 11C was administered to a single leaf as 11CO2 gas as a 30 sec pulse in continuously streaming air in a leaf cuvette with PAR 750 µmol m-2 s-1, as previously described (Babst et al., 2013). Leaf fixation, carbon export from the leaf, and 11C-photoassimilate transport velocity were monitored in real-time using a detector built into the leaf cuvette, and two detectors shielded with collimated lead and positioned to detect radioactivity from the stem. After the pulse of 11CO2, plants were incubated in place with continuous airflow through the leaf cuvette for 2–3 hr to allow sufficient time for transport of 11C-photoassimilate through the stem. Transport velocity was calculated as the distance between the stem detectors divided by the transit time of the 11C radioactivity between the first and second stem detectors. Positron Emission Tomography (PET) imaging was performed by positioning the stem and petiole within, and the load leaf outside of, the field of view of a microPET R4 (Concorde Microsystems, Knoxville, TN, USA) approximately 2 hr after 11CO2 was administered. Data was acquired from stem and petiole radioactivity emissions for 10 min, and a 3-dimensional image was reconstructed as a single frame using microPET Manager 2.3.3.0 software (Siemens Medical Solutions USA Molecular Imaging; Knoxville, TN, USA). To obtain cell geometrical data for the number of sieve plate pores per plate, the radius of pores, the radius of the tube, and the thickness of the plate, morning glory stem segments of approximately 5 cm length were cut and immediately immersed into 70% ethanol at –20°C to prevent callose formation on the sieve plate. The tissue was freeze substituted for at least 1 week. After that, longitudinal- and cross-sections of approximately 1 mm length were taken and immersed in a medium containing 0.5% proteinase K, 8% triton X 100 at pH 8 (Mullendore et al., 2010). The tissue was digested at 55°C for 2–6 weeks with weekly changes of the digestion medium to remove the symplast. After digestion of the symplast the tissue was freeze dried and sputter coated. 40 SEM images per sample point were taken with a FEI (Hillsboro, Or) Quanta 200 FEG SEM to measure and quantify cell geometrical data. Measurements were performed with imageJ software as described in (Mullendore et al., 2010). To collect data on the average length of sieve elements, longitudinal hand sections of freeze substituted tissue were taken with a razor blade, stained with calcofluor white and aniline blue, and images were taken with a Leica SP8 confocal microscope at excitation wavelength 405 nm and emission collection at 420–480 nm for calcofluor white, and 550–600 nm for aniline blue fluorescence. Measurements were performed with Leica LAS software. Primary leaves in morning glory seedlings were loaded with Carboxyfluorescein diacetate as described previously (Wright and Oparka, 1997). After 1 hr seedlings were removed from the pots, the soil was washed off the primary root and fluorescence was monitored with a I3 filter block on a Leica DMLFSA microscope and images were taken with a DFC-300 camera. The conductivity k is required to compute the value of the pressure differential necessary to drive flow from equation (1). For the simple case of a cylindrical pipe, the conductivity is given by k=r2/8, where r is the radius of the pipe. However, the phloem transport pathway comprises a file of many short sieve elements lying end-to-end, separated by perforated screens (sieve plates) that each add considerable hydraulic resistance. To account for the presence of sieve plates, we modeled the dependence of the conductivity k on anatomical parameters following (Jensen et al., 2014, 2012). Direct numerical simulations of low-Reynolds-number-flow through sieve plates have confirmed this analytical method (Jensen et al., 2012). The total resistance of a stem section of length L is Rtot=L/ℓ(RL+Rp), where the factor L/ℓ is the number of tubes arranged in series. (A6) k=[ 8r2+3πNr2rp3¯ℓ (11+3β2+α1+6β2+3β4) ]−1. Canadian Journal of Botany 58:826–832. Plant & Cell Physiology 54:1016–1025. Journal of Theoretical Biology 259:325–337. Frontiers in Plant Science 3:151. Journal of the Royal Society Interface 10:20130055. The Plant Cell Online 10:35–50. Annual Review of Plant Physiology and Plant Molecular Biology 48:191–222. Does Don Fisher's high-pressure manifold model account for phloem transport and resource partitioning? Frontiers in Plant Science 4:184. Journal of Theoretical Biology 220:419–455. Plant, Cell and Environment 29:1715–1729. Journal of Experimental Botany 48:1807–1814. Thank you for submitting your article "How Plants Alter Sieve Tube Physiology and Geometry to Maintain Phloem Transport to Sinks" for consideration by eLife. Your article has been reviewed by three peer reviewers, and the evaluation has been overseen by a Reviewing Editor and Detlef Weigel as the Senior Editor. 1) To remove the oak section from your manuscript, as well as the section on p-protein. 2) To concentrate on the presentation of your strong data set from morning glory, and polish the presentation to make your story more accessible to the readers. Knoblauch and colleagues investigate two issues that challenged the Münch hypothesis of solute long distance transport in the phloem. 1. Structural components of the phloem and 2. The hydraulic conductivity of the phloem. I think this paper fills a big gap in our current understanding of phloem transport. The Münch hypothesis has been accepted for a very long time but the experimental fundaments were rather weak. The authors have done an outstanding and obviously very labor-intensive study to show that the Münch hypothesis can indeed explain how phloem transport happens. In terms of its significance there's no doubt in my mind that this paper will become the paper on this topic. Additionally, this paper raises several important issues for future research – one consequence is for example that phloem unloading must be re-evaluated. Nevertheless, I have some issues that I'd like to address. 1) I found this paper complicated to read and I believe the authors would help their case if they helped the reader a little bit more. 2) In the second paragraph of the subsection “Is osmotically driven pressure flow sufficient to account for phloem transport in tall trees and long vines?”, the authors state how many cells, sieve plates and so on were measured. This is certainly important – in my opinion it would help to give an estimate how many of these diameters or plate/pore numbers were observed for each individual “n" they were used for (Figures 1 and 3 and 6(?)). 3) Turgor measurements in root cortical cells were performed for 7.5 m plants. This value is also assumed for the defoliated plants and the oak trees. I appreciate that these measurements can't easily be done on oak roots but I wonder why this parameter wasn't obtained for the defoliated plants. I realize obtaining this parameter can't be done easily now so I would like to have an explanation why the 0.59 MPa can be assumed in both cases where the value wasn't determined. This is – in my opinion – particularly important in the case of the oak tree. 4) The section on trees is very interesting and the calculations sound – but in its current shape it is the weakest section of the paper and a bit iffy. It is stated that "Tube geometrical data provided evidence that tube conductivity in the trunk exceeds this [the conductivity of at least 10 µm2] by far" (subsection “Is osmotically driven pressure flow sufficient to account for phloem transport in tall trees and long vines?”, last paragraph). I assume these geometrical data were taken from the "bark samples" collected along the stem and branches (in the eleventh paragraph of the aforementioned subsection). If so: are these data part of the numbers given in the second paragraph? In any case it would be interesting to actually see these data! Without these data the only "hard" data on trees are the measurements of source mesophyll turgor and the height of the tree. In this context it is particularly important to convincingly make the case why the data from De Schepper et al. 2013, collected on a different oak species of a different age, can be used. The same goes for the sap viscosity and sink turgor that is assumed to be identical to that determined in morning glory. 5) Figures 1 and 3: It is important to compare the values shown in both figures directly. For this purpose it would be extremely helpful if the panels appeared in the same order in both figures – this goes also for the scaling on the ordinate. Maybe also a Table for direct comparison would be a good idea. Also: why are there no standard errors/deviations shown in Figure 3? This manuscript describes an integrated series of structural, physical and physiological studies, conducted on Ipomoea nil (morning glory) and Quercus rubra (red oak), to address the question as to whether the Muench pressure flow hypothesis is valid. Collection of anatomical and physiological data was carried out on morning glory plants that had undergone two types of pruning. In one, branches and flowers were removed to produce ~ 7 meter long vines having source leaves distributed along the vine axis, but simplified sinks, namely the vegetative apex (and a few small expanding leaves) and the root system. In the other, as the vine grew, lower mature source leaves were removed to provide a situation in which the lower stem region was leafless; the same two sinks were in place. A pressure probe was used to determine the turgor pressure in the sieve elements (SE) located in the main vein of source leaves located along the plant axis. In parallel, anatomical studies performed on SE at various sites along the stem yielded parameters used to compute sieve tube radius, sieve plate pore numbers and radii, SE lengths and local phloem conductivity. These data were then used to calculate the theoretical pressure gradient that would be required to achieve the measured flow velocities. Based on data presented, the authors conclude that their study on morning glory provides experimental support for the phloem pressure flow model. 1) The techniques employed in this study are quite elegant and, if the manuscript had been well written (and proofed carefully by all authors) it could have been a pleasure to read. In addition, it is disappointing that, having gone to such pains to collect the anatomical data, the authors used assumptions from plants like Arabidopsis to design aspects of their experiments. For example, they assumed that, as in Arabidopsis, symplasmic phloem unloading occurs in morning glory roots. Added to this, even if symplasmic unloading were to take place, making turgor pressure measurements on cortical cells, rather than on SEs located in the sink region of the root, confounds data interpretation. Given that numerous cells are positioned between the SE and the cortical cell layer, the measured p value of 0.59 MPa will be lower than that within the root sieve tube system. Putting this aside, one has to puzzle as to how the authors arrived at the value of 0.485 MPa for the "measured pressure differential." Inspection of the data presented in Figure 2 indicates an average p value of 1.2 MPa for the lower leaves which can be applied to the bottom leaf; this gives a delta p = 0.6 MPa, and a distance of ~2.5 m (measured based on the figure) from this bottom leaf and the point where the p root value was measured. This gives a delta p of 0.24 MPa, which we know would be an overestimate. So, the data are in the ballpark, but the authors have not yet knocked the ball out of the park! 2) Results from the second type of pruned/manipulated vine are of more interest as they uncover a nice interactive network at play to adjust the parameters of the phloem, in a positional-dependent manner, in response to the imposition of increasing distance between the root and the source leaves. 3) The work on red oak is greatly weakened by being based on just too many assumptions and so we recommend that it be removed from the manuscript. The same can be said of the p-protein aspect of the manuscript. 4) Discussion of the pressure manifold model is weak; the data presented in Figure 2 provides support for this model. However, the data in Figure 4 suggests that for plants like trees, the manifold model might need to be revised. The authors aim to address two fundamental questions regarding pressure flow hypothesis that have been long debated and that are key to understand phloem physiology: the continuity of the flow (are the pores blocked by p-proteins?) and conductivity in trees (is the pressure as high as necessary for the increased distances?). They argue that part of the controversy is caused by lack of reliable data due to technical constrains and develop new methods to avoid these problems. 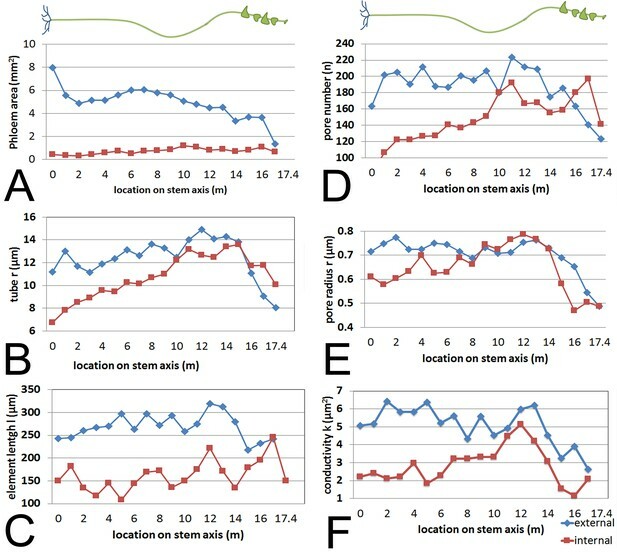 Here they measured in situ sap viscosity and phloem pressure in a morning glory plant partly defoliated and also the red oak tree to show its phloem characteristics, by great increase of sieve tubes conductivity, is still in accordance with the Munch model, a matter of debate for long distance sap flow movement in trees. They also provide evidence in Arabidopsis that p-proteins, long thought to block phloem sap flow at sieve plates, are in fact able to diffuse through them and thus still allow pressure driven sap flow. The authors, using a set of complementary approaches, are able here to apprehend the different parameters driving the sap flow in the sieve tube. Their results validate the Munch pressure flow model in sieve tubes and show the plasticity of phloem to adapt its physical characteristics through modified source/sink balance. The techniques developed by this team are a great technical advance for phloem studies. 1) The authors don't explain how their FLIM calibrations confirm the efficient use of 2-NBDG as a molecular rotor suitable for sap viscosity assessment. This point need further clarification and may require a supplemental figure. Also, the authors argue for that the viscosity value obtained through the FLIM experiment corresponds to an 18% sucrose concentration, in accordance to published values of various plant species. It would have been better to confirm this result directly in the morning glory vine model to strengthen this result. 2) Measuring the phloem parameters in the red oak tree model, the authors assume a sap viscosity of 1.7 mPas, in accordance with the value obtained through FLIM experiments with the morning glory model. If FLIM experiment are not feasible in trees, why not try here to obtain an estimation of sap phloem viscosity through concentrations determination of extracted phloem sap contents (previously used technique to estimate sap viscosity mentioned by the authors in the text)? It would have more strength than just an assumption. 3) The authors use Arabidopsis plants expressing YFP-tagged SEOR1 to show in vivo p-protein agglomerations block sieve tubes only occasionally and temporarily, which doesn't affect phloem transport. But we still don't know if the situation of P-proteins is same or similar in other plant species. May I ask the authors to discuss? We have followed all suggestions with a few exceptions that we have explained in the text. We would like to change the title of the manuscript from “How Plants Alter Sieve Tube Physiology and Geometry to Maintain Phloem Transport to Sinks” to “Testing the Münch hypothesis of long distance phloem transport in plants”, because we feel that this better reflects the work presented in the revised manuscript. Both sections have been removed. The revised manuscript includes only the morning glory data and the text has been revised to emphasize the significance of these data to the long-standing question of phloem transport in large and long plants. We believe that the removal of the P-protein data and oak data has made the story much less complex and easier to access. All sample sizes (n) were provided in the original manuscript in the figure legends as requested in the eLife author guide. However, we agree that it would be beneficial to provide an overview and to accomplish this we have added a sentence to the Introduction. Because the oak data have been removed from the manuscript, the central point of the concern is obsolete. However, we would like to explain why we did not measure root pressure in partly defoliated long plants. As described in the manuscript, measurement of root turgor pressure required the removal of the root system from the pot, putting the root system in a plastic bag, cutting a hole in the bag and pulling a root out, keeping the root moist and mounting it on the microscope stage. Doing this with a large plant appeared not feasible. A single minor crack in the highly delicate stems of morning glory would have jeopardized the project and likely have resulted in errors in the measured turgor pressures. This part has been removed from the manuscript. We had provided the source data, but we agree that it would be beneficial to have an easy accessible direct comparison of the data between the plants. We therefore have generated Figure 3—figure supplement 3 showing a graphical comparison as well as tables for the individual parameters. 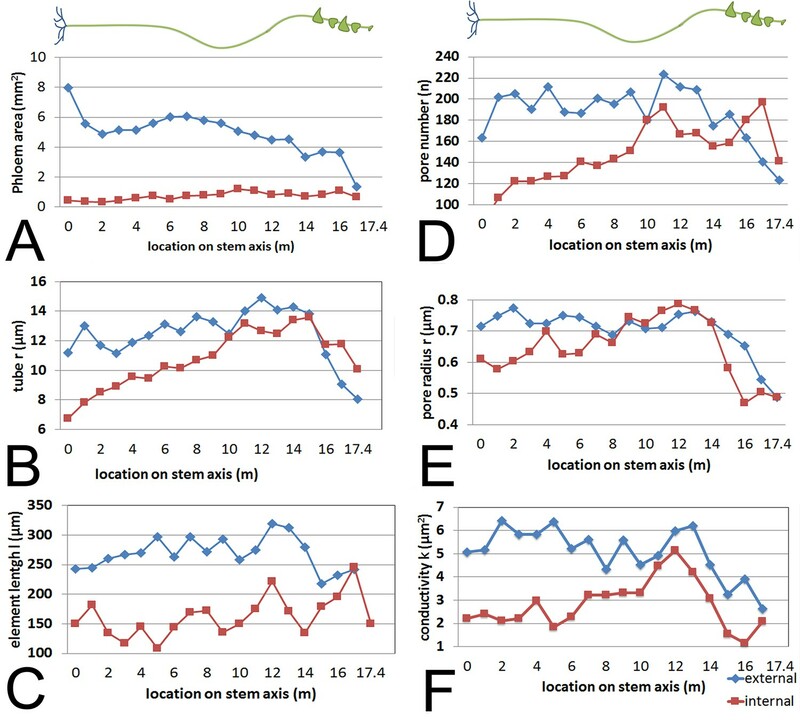 We have also included the error bars in this figure supplement as they appeared distracting in Figure 3. A statement in Figure 3 legend refers readers to Figure 3—figure supplement 3 for standard deviations. 1) The techniques employed in this study are quite elegant and, if the manuscript had been well written (and proofed carefully by all authors) it could have been a pleasure to read. In addition, it is disappointing that, having gone to such pains to collect the anatomical data, the authors used assumptions from plants like Arabidopsis to design aspects of their experiments. For example, they assumed that, as in Arabidopsis, symplasmic phloem unloading occurs in morning glory roots. Not only in Arabidopsis, but in all plants studied so far including monocots, symplastic unloading has been shown in the root unloading zone. We have added Figure 2—figure supplement 3 showing proof of symplastic unloading in root tips in morning glory. Added to this, even if symplasmic unloading were to take place, making turgor pressure measurements on cortical cells, rather than on SEs located in the sink region of the root, confounds data interpretation. We would certainly have preferred to take direct sink sieve tube measurements in addition to cortical measurements, but as noted in the original manuscript, this is impossible. In roots the phloem is located in the central cylinder which would require splitting the root in half to access the sieve tubes for measurements. How this could be done without injury and major impacts on transport, unloading, and turgor is not clear to the authors. Given that numerous cells are positioned between the SE and the cortical cell layer, the measured p value of 0.59 MPa will be lower than that within the root sieve tube system. Correct. This supports our statement in the original manuscript. Our calculations show how much pressure is needed to overcome frictions within the tube system. The results show that most of the pressure differential will be consumed and that there is not a large margin for a high-pressure manifold system. Therefore, one has to assume that symplastic unloading does not require large pressure differentials as outlined in the Discussion and Figure 7. But the results do not contradict a pressure flow model. Putting this aside, one has to puzzle as to how the authors arrived at the value of 0.485 MPa for the "measured pressure differential." Inspection of the data presented in Figure 2 indicates an average p value of 1.2 MPa for the lower leaves which can be applied to the bottom leaf; this gives a delta p = 0.6 MPa, and a distance of ~2.5 m (measured based on the figure) from this bottom leaf and the point where the p root value was measured. This gives a delta p of 0.24 MPa, which we know would be an overestimate. Figure 2 shows 5 individual measurements, which average 1.08 MPa, not 1.2 MPa. Subtracting 0.59 MPa of sink turgor results in a pressure differential of 0.49 MPa. We do not see any problem with our calculations and the text clearly states what we have done. The only discrepancy is that we provided data with three digits (0.485MPa) instead of rounding to two digits (0.49 MPa). We have changed this in the revised manuscript. So, the data are in the ballpark, but the authors have not yet knocked the ball out of the park! According to our measurements, 0.21MPa are required to overcome friction and to drive flow at the measured velocities over a distance of 1m through the tube system. As concluded in the original manuscript, the measured pressure is high enough to drive the flow to any sink in the plant as the maximum source to sink distance does not exceed 2 m. Given the variability of tube geometry and the unknown numbers of plasmodesmata connections and size exclusion limits in the unloading zone it would be quite unexpected if the numbers matched 100% and it would be presumptuous for us to claim that we “knocked the ball out of the park” (and we actually do not see where we potentially have done this to elicit the reviewer’s comment). It is our opinion, however, that we are permitted to claim that we have provided strong support for pressure driven mass flow. Certainly our data put to rest the idea that pressure driven flow is not capable of transporting photoassimilates over long distances. This section has been removed from the manuscript. We do not see why Figure 2 provides support for the high-pressure manifold model. The model requires significant pressures in the unloading zone as outlined in Patrick 2013, and it appears that reviewer 1 agrees with us that the conclusions from our data does not support this model. We would prefer to keep the conclusions as presented. 1) The authors don't explain how their FLIM calibrations confirm the efficient use of 2-NBDG as a molecular rotor suitable for sap viscosity assessment. This point need further clarification and may require a supplemental figure. The calibration curve shown in Figure 2—figure supplement 1C is generated by measuring 2-NDBG lifetime versus known viscosities of aqueous sucrose solutions. We have added better explanation in the figure legend to clarify this. Also, the authors argue for that the viscosity value obtained through the FLIM experiment corresponds to an 18% sucrose concentration, in accordance to published values of various plant species. It would have been better to confirm this result directly in the morning glory vine model to strengthen this result. All phloem sap viscosity values (based on stylectomy or exudates) are currently based on estimations and are not measured in situ. The small volume in stylectomy leads to rapid concentration and viscosity changes because of evaporation which can be limited, but not entirely prevented. Exudates often contain contaminations from neighboring cells and the apoplast and oxidization may lead to gelling of the sap (e.g. in Cucurbits). In addition, sieve tube viscosity is dependent on all solutes in the sap, not only on sucrose. Since the primary aim was to measure viscosity and not sucrose concentrations, we decided to develop a method for in situ measurements by FLIM, calibrated against known viscosities which we believe provides better values than invasive methods. We acknowledge support from the Franceschi Microscopy and Imaging Center at WSU. This work was supported by National Science Foundation grants IOS-1146500 (MK), IOS-1022106 and IOS-1456682 (NMH, MK), a Harvard Bullard Fellowship (MK), a Carlsberg Foundation grant 2013_01_0449 (KHJ), the USDA National Institute of Food and Agriculture, McIntire Stennis project 1009319 (BAB), and the U.S. Department of Energy, Office of Science, Office of Biological and Environmental Research, under contract number DE-AC02-98CH10886 (BAB). © 2016, Knoblauch et al. The movement of water by osmosis causes pressure differences that drive the transport of sugars over long distances in plants.